Pittsburgh, PA (September 16th, 2016) – This weekend, visit a Howard Hanna open house, browse our ad in your local newspaper, or watch the Sunday Showcase of Homes to learn about properties featuring an HSA Home Warranty. 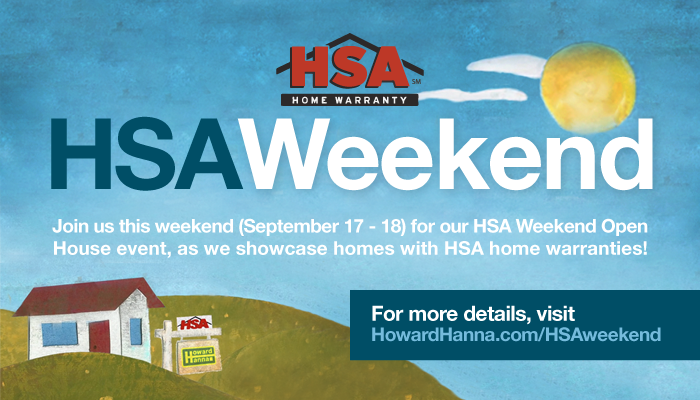 On both Saturday, September 17 and Sunday, September 18, Howard Hanna, through Howard Hanna Insurance Services, is working with HSA Home Warranty to feature homes that are protected with an HSA home warranty. On Saturday and Sunday, open houses will have sales associates on site to offer information about the property and also to answer questions about home warranties. As a real estate leader for nearly 60 years, Howard Hanna recognizes the comfort that’s offered with a home warranty. It helps to protect homeowners from the high cost of unexpected failures by replacing or repairing covered items that may break down due to normal wear and tear. Home warranties help to safeguard one of the most important investments many will ever make. The home warranty is different from homeowner’s insurance. The two products can work in conjunction with each other. A home warranty provides coverage on many of the major system components and appliances typically found in a home. It’s an affordable way to help protect homeowners against unexpected and potentially expensive repair bills, helping to secure the best protection available based on budget and home.